Remote sensing in potatoes is being actively investigated for its value in ensuring a high-yielding, healthy crop. Although in its relatively early stages in Canada, data collection through remote means and the related data analysis is developing at a swift pace. 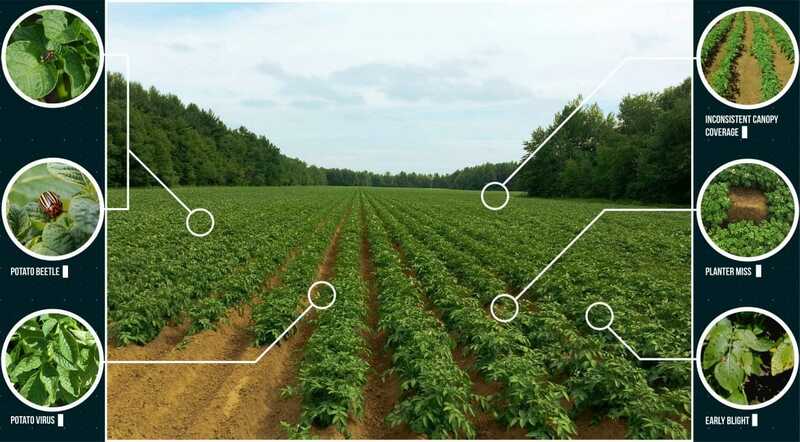 In this edition of Roundtable, Spud Smart gathered experts to report on the remote sensing tech being used in potatoes, the present value of the information collected and where the future is headed. Dr. Aitazaz Farooque, Assistant Professor, Faculty of Sustainable Design Engineering at the University of Prince Edward Island. Dr. Bernie Zebarth, Research Scientist at the Fredericton Research and Development Centre, Agriculture and Agri-Food Canada. Giri Baleri, Vice President of Marketing at predictive data analytics company Resson, New Brunswick. Brennan Gaudet, Precision Ag Specialist at Paradigm Precision (A&L Labs) in P.E.I. Yves Leclerc, North American Director of Agronomy, McCain Foods. Dr. Anne Smith, Research Scientist at the Lethbridge Research and Development Centre’ Agriculture and Agri-Food Canada. First, let’s look at how remote sensing in agriculture is currently defined. Farooque describes it in simple terms as a non-destructive estimation of the state of a crop. “It’s always a prediction, using some sort of sensor – a regular camera, thermal or hyperspectral camera mounted on a drone, airplane, satellite or farm equipment – to gather data on the crop and also in some cases, the soil,” he says. “This data is analyzed and compared to a set of baseline data, leading to effective crop management decisions. In Zebarth’s view, there are three levels of how remote sensing data is applied. “The first is very simple,” he says. “You have an image that you look at and use as an aid in scouting. It’s simple, but picks up anything that’s different. It doesn’t tell you why, but you can go and check it out. Zebarth lists other items that a remotely-taken image can point out to be slow crop emergence and lack of drainage. He says the type of information you get depends on the type of camera, and when and how often the images are taken. The second level is when the data is calibrated and used to calculate a vegetation index such as NDVI (normalized difference vegetation index) or WDVI (weighted difference VI, which Zebarth says performs better than NDVI in potatoes). The data is then taken into account in management decisions. The third level of remote sensing application, says Zebarth, is more sophisticated hyperspectral imaging. He notes companies are working on this (developing algorithms and training the system to recognize given parameters) as well as academics such as Idaho State University’s Dr. Donna Delparte. Baleri adds more sophisticated remote sensing application is also being achieved through combining remote sensing data with weather information and soil parameters such as moisture content to create prescription maps. These maps are then used, for example, to help predict yield or decide where and what action should be taken for disease control. Baleri explains that whether his firm uses data from satellites, drones, airplanes or equipment-mounted systems depends on the client-farmer’s goal. Farooque notes satellite data is also limited in that it might take significant time for a particular satellite to return to a previous position, and that it’s also affected by clouds, temperature and wind. Farooque notes drone use is picking up because flight height can be adjusted to achieve the resolution needed. For his part, Baleri believes overall it will take several more years to develop fully-automated remote sensing technology, and that growers’ trust in it will grow over time. He and his team have received a research grant from Canadian Space Agency to design and develop a tiny satellite to be launched in Atlantic Canada, with a platform specifically for agriculture. Gaudet notes remote sensing is not intended to solve all the problems in a field, but another tool to use to help make management decisions on farms. In Smith’s view, the future development of hyperspectral sensors may help differentiate different stresses, but to date these sensor systems are expensive. She adds the use of thermal and microwave sensors systems may some day also assist in providing complementary information to multispectral and hyperspectral sensor systems. Very well written, keep it up.